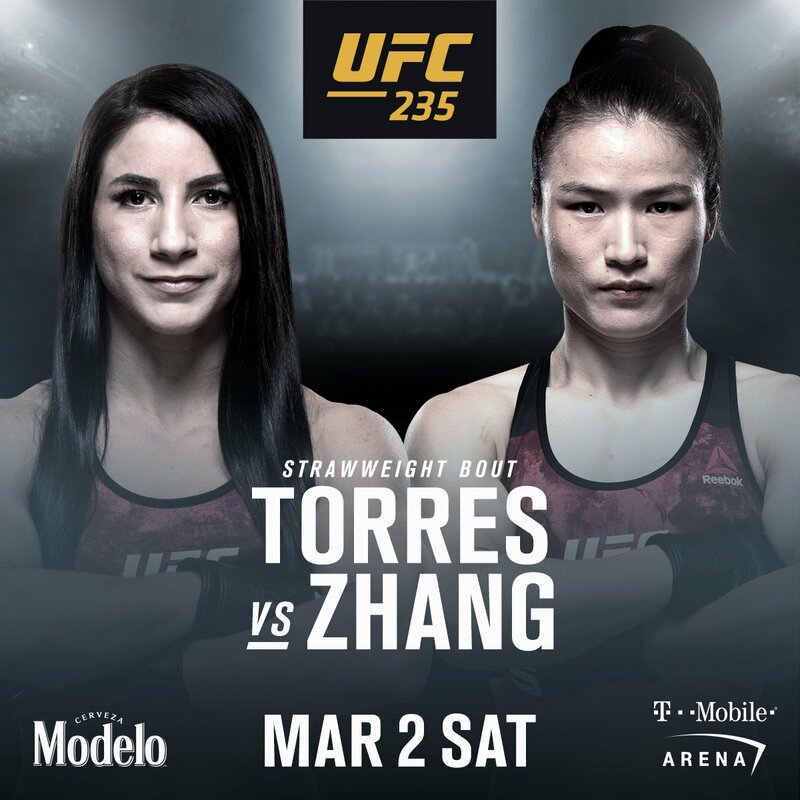 Yesterday the UFC announced that Tecia Torres vs Zhang Weili has been added to UFC 235 Feb. 3 at the T-Mobile Arena in Las Vegas. This fight is at Strawweight. If you watched the Beijing, China UFC show, you will know that Weili destroyed Jessica Aguilar in the first round. That didn't shock me but it shocked plenty of fans. And the show was on UFC Fight Pass so it's time to showcase Weili to a larger audience. Weili is 29 years old from China. Her record is 18-1 and 2-0 in the UFC. We have to find out of she is for real. Tecia is 29 years old and she trains in Colorado Springs with her fiancee Raquel Pennington. Her record is 10-3 and 5-3 in the UFC. She lost her last two fights to Jessica Andrade and Joanna Jedrzeczyk. I don't see this fight being any easier. Tecia is a points fighter. She's a kickboxer who relies on quickly darting in and out for fifteen minutes. In thirteen fights she has one finish. She is very similar to Weili's first UFC opponent Danielle Taylor except Tecia is better at that strategy. If Weili is aggressive like she was against Jessica, this won't go the distance. I am already seeing complaints about this being a mismatch. And I do agree that Tecia is ranked too high. You guys are missing the point. The purpose of this fight is to showcase Weili against a top ten ranked opponent on a major PPV. Let's see how she does under a larger spotlight. We don't know who was offered this fight but I bet Tecia wasn't the first choice. If Weili performs as she did in China, a star is born. Her next fight will be more interesting. It's a mismatch that I do not like only because Tecia lost her last fight to Joanna and she is certain to lose this fight. Sorry I don't like that type of contest. However you are right, it will show the world how good Weili Zhang is and that she is to be taken very seriously. I can only hope her next opponent is a much better, tougher, fighter. A fighter that will stand and fight hard standing or on the ground. As for Torres and her partner, it may time for both to retire. I hate to say any of this because I like them both. They have been decent and courteous to me on Twitter and seem like good, decent human beings in general. But the hard cold facts will not change whether I like them or not. It's a shame, that is how I feel abut this whole deal. Thanks Frank. Yours David.